Well then, that’s Christmas by and 2014 well under way. I hope you all had a good time over the festive period. I had a very enjoyable few days off as well as a very good few days at the studio. Nita was working twelve and half hours shifts on 27th & 28th December so I used these to the full working on the An Teallach commission. After much banging of my head against the wall in the early stages of this painting, I’m at last starting to make headway and had another good long session yesterday that left me feeling quite optimistic that I’ll get it finished fairly soon. It’s been quite a challenge but I’ve really enjoyed working on this piece and I’ve certainly learnt quite a lot. I’m also thinking that I may have to revisit this fantastic mountain again sometime before too long…..I think we were last there about seven years ago. Still no serious walking done recently though. The weather has been pretty appalling and on the odd day when it wasn’t blowing a gale and falling with rain, either Nita or I were working. We managed a short wander through the local country park on New Years Day which was nice ….it’s a beautiful mix of grass, bog and trees with lots of bird life and if you’re in the right place at the right time …deer. We finally made it out yesterday we spent several very enjoyable hours wandering along two sections of the West Highland Way on the eastern shores of Loch Lomond. 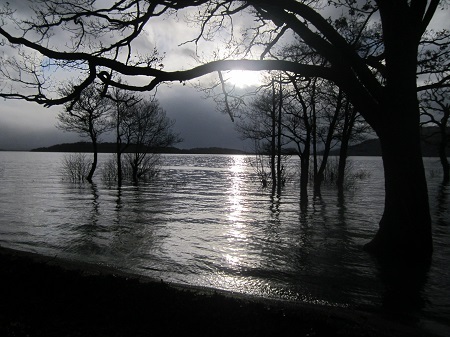 Have to admit though, that we hadn’t banked on the water level in Loch Lomond being so high and we had to make detours around a couple of sections of the path that were completely flooded by the loch. 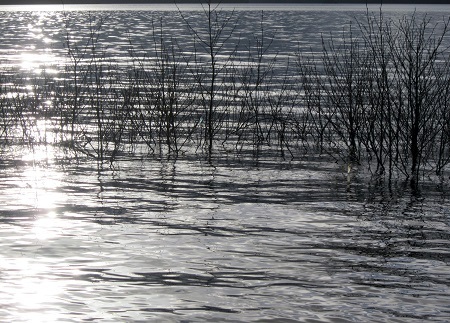 It certainly made for some interesting views with the trees and bushes around the edge all appearing to grow out of the water. It wasn’t a huge walk, just a few miles, but it got the legs working again and we’re already starting to think about getting back onto the hills again next week with a bit of luck. Looks like being a fairly busy year this year. I already have work booked for an autumn show at a gallery in Newcastle upon Tyne and then have the solo show and big drawing project at the end of the year lined up. I’ve also just been asked to show a few pieces of work at the Frames Gallery in Perth as part of their spring exhibition, so I’ll look forward to that ….it’s a great gallery. I’m hoping to do more work with photographer Dan Thornton later in the year. 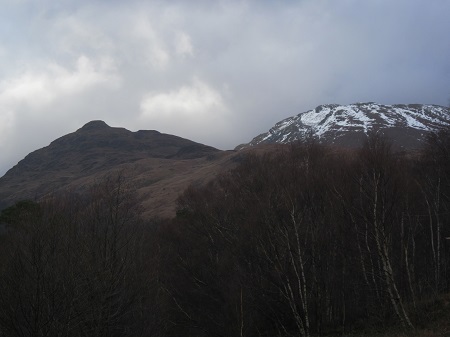 Walking wise, well, we’ll have to see how it goes but I’m hoping to try and walk a few more Munro’s ….I’ve slipped back into bagging mode again and nine more Munro summits would take my tally up to 120! I’ve always said I’d never be able to, or want to walk all 284 of them, but I do like the excuse to go and visit places I’ve never been before …so I guess my new target is to do half of them ….I should manage that within a few years with a bit of luck! Must dash now and get myself down the studio. My very best wishes to everyone who reads this for a great 2014.